Courtyard by Marriott Times Square West welcomes HX: The Hotel Experience to Jacob K. Javits Center in New York City from Sunday, November 13th through Tuesday, November 15th, 2016. With over 12,000 hospitality leaders attending one show, attendees have the opportunity to network, sell and innovate hospitality. This year’s exhibitors include The Portable Bar Company, CleanBrands, LLC and many more. Attendees are welcome to stay the night at Courtyard by Marriott Times Square West. 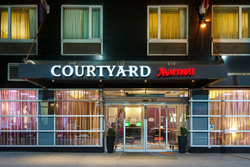 Located just a 15 minute walk away, Courtyard by Marriott Times Square West offers hospitality professionals the comfort of a New Stay™. With a daily happy hour in the Bistro, comfortable beds and a convenient location, Courtyard Times Square West welcomes HX: The Hotel Experience attendees to stay the night. For more information, please visit http://www.thehotelexperience.us/hx2016/Public/Enter.aspx?ID=427&sortMenu=101000.